Generally everyone worries about hair loss .Mostly men and women concentrate on the hair growth and they are very interested about the tips related to the faster hair growth.Firstly,everyone need to be patience inorder to obtain hair growth. Most of the americans used this pepper for more than 9000 years in medicine preparations.It helps to stimulate new hair growth.Applying mixture of cayenne pepper and olive oil help to promote hair growth and combat baldness. Massaging the scalp help to increase the blood flow.Massaging olive oil oil into scalp and leave it overnight.Wash it off with a mild shampoo.It acts as a good cleanser. Aloe Vera is a good conditioner.Extract aloe vera gel from the leaves .Mix the gel with egg and apply it to the hair.Apply it once for every two weeks. For a cool feeling,mix aloe vera gel with almond oil and apply it to the scalp. A very easy tip is,with the coconut oil.Massage your scalp with warm coconut oil every day .It helps to gain thick hair. 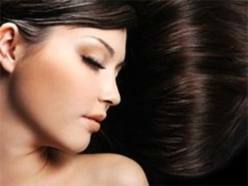 Add water and spoonful of white vinegar,apply this to your hair inorder to obtain hair growth. Wash your hair daily with the shampoos that have hydrolized protiens.It can make hair longer and thicker. If I used a hair loss treatment would it make my hair thicker? A hair loss treatment for women, I mean. I'm not balding or anything, I just have naturally fine hair and I'd like for it to be thick and luscious. Very nice post. I appreciate this site. Blood circulation increases the production of cells in the head. By production of new cells enhance the growth of hair in the head. Effective treatments for some types of hair loss are available. But some hair loss is permanent. Female pattern hair loss is a common reason for Hair loss in women. This is usually in one area of the scalp, which occurs on the top of the head. It might be hard to realize but women produce the same testosterone hormone as men, only in much smaller amounts.